Orji Uzor Kalu: The quintessential Hausa Fulani Slave. A Drowning Man, looking for where to Perch. It has come to the knowledge of the worldwide family of IPOB and it's leadership concerning the wild and widely reported comments of Orji Uzor Kalu regarding the whereabouts of our leader Mazi Nnamdi Kanu. This man Orji Uzor Kalu have again made claims that could only classify him as either mentally unstable or beholden to the Fulani caliphate interest, to the extent that he has almost lost his senses. His spurious claim that the overall leader of IPOB and prophet of our time Mazi Nnamdi Kanu has made his way to London via Malaysia is confirmation that he would do or say anything to escape his ongoing corruption scandal. Worse still, he might be a hapless victim of a well orchestrated blackmail by his Hausa Fulani Islamic masters or on hallucinogenic drugs. That men like Orji Uzor Kalu rose to the lofty height of a governor in the South East is indicative of the mess and moral bankruptcy at the heart of governance in that region, he should not be blamed. In the second republic, men like Orji Uzor Kalu would only be found useful as a political thug. That a man that have spent his entire fraudulent life lying, deceiving and running errands for his Hausa Fulani Islamic caliphate masters made this laughable outburst is not entirely unexpected. We expect many more compromised Efulefus to follow suit in the coming days. After all selling collective Igbo interest and by extension that of Biafra has been their hallmark all their political lives. It didn't start today but their era is coming to an end. Biafrans are now well accustomed to Hausa Fulani errand boys euphemistically referred to as Igbo leaders coming out once in a while to condemn what is in the collective interest of the people. They have no qualms about conniving with Hausa Fulani Islamic soldiers to kill and maim their own people as long as their meaningless and fake status of Igbo leader is left intact. Only a man without honour, a clearly definable paternal lineage as tradition demands and devoid of honour will spout such unfounded uncorroborated nonsense in the hope of letting Buratai off the hook for the abominable atrocities his soldiers committed in connection with the disappearance of our leader when his home was raided on the 14th of September 2017. Both the United Kingdom and Malaysia are civilised countries and not as corrupt as Nigeria, where there is no accurate record of migration in and out of the country. What Orji Uzor Kalu is saying in essence is that United Kingdom government officials are lying when they rightfully demanded the whereabouts of Mazi Nnamdi Kanu. For the information of those who may have fallen for the bare faced lies of Orji Uzor Kalu, United Kingdom is an island nation surrounded by water and near impossible to enter without being documented. If our leader is in the UK their government will not bother demanding he be produced by the Buhari regime. Lying it seems runs deep in APC. It is not right to apportion blame to Orji Uzor Kalu alone but to the entire people of South East and Abia State in particular for allowing such a shamelessly proud Hausa Fulani slave to rise to political prominence. There is no other more humiliating indictment of the an entire race than that of a man who in traditional Igbo setting would not be allowed to speak in public, suddenly rose to political prominence in a land brimming with academic brilliance and excellence in every field of human endeavor. There seems to be an ongoing battle among so-called political leaders in Biafraland as to who will emerge the anointed son of the Fulani caliphate. IPOB through her lawyers will compel Orji Uzor Kalu to appear in court alongside Buratai on the October 17, 2017 to tell the world, under oath, what he claims to know about the whereabouts of Mazi Nnamdi Kanu. His laughable assertion that the IPOB leader is in London is confirmation that all along he has been working in tandem with Gov. Okezie Ikpeazu, Willie Obiano, Rochas Okprocha and others to slaughter as many IPOB family members as possible in order to please the core North. Any right thinking person, aware of the dubious upbringing of Orji Uzor Kalu and his fraudulent paternity claim against the famous businessman Nnanna Kalu, a man that publicly denied him, should dismiss his latest antics as another calculated attempt to endear himself more to his Hausa Fulani Islamic handlers. The question Orji Uzor Kalu must answer is this, if indeed you are Nnanna Kalu's son, why do you tell people you come from Igbere when the man you fraudulently claim is your father is not from there. rejected your monetary offer to him to compromise his uncompromising stance on Biafra restoration. 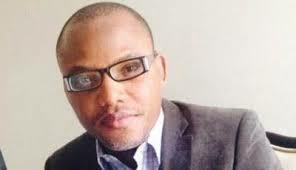 Thankfully today you have told the world that Nnamdi Kanu cannot be bought. The politics of selling the interest of the East to the North is why all Hausa Fulani stooges in government houses across the South East ganged up with their Hausa Fulani masters to kill Nnamdi Kanu and proscribe IPOB. Their wish having come through, they are now lining up to exonerate the military because they know their names will be mentioned as accomplices to mass murder of IPOB family members. Orji Uzor Kalu and his co-conspirators must await the fury of the people which is slowly building up. The same way Romans rose against the murderous Brutus and his gang that slayed the popular Julius Ceasar, so will the mob in Biafraland descend on all traitors in no distant time. Planning and executing the mass murder of IPOB members including our leader and looking to cover up your complicity with bare faced lies, will expose and render Orji Uzor Kalu inconsequential and expose him for the Hausa Fulani slave he truly is. The masses will set an example with the likes of Orji Uzor Kalu, Okezie Ikpeazu and Willie Obiano in no distant time that other quislings like them may learn. We have formally instructed our attorneys to add the name of Orji Uzor Kalu as one of those who might help in locating of our leader. He should be prepared to present his evidence in a court of law and be cross examined under oath. The surviving members of Kanu family have all denied ever talking to the lying Orji Uzor Kalu about the whereabouts of our leader, so he should be prepared to mount the witness box because his lies have gone on for far too long.